Over the past week, the benchmark distributed its monthly dividend of $0.3787 which is slightly lower compared to the previous dividend. We continue to see a strong correlation between the high-yield bonds and the stock market. Most of the closed-end funds from the sector are traded at positive Z-score, so you need to be cautious when you choose your long positions. GHY is a potential buying opportunity based on its discount and current yield. The closed-end funds from the high-yield sector significantly increased their prices over the past three months. Currently, most of them are traded at positive Z-scores, which is an indication that they have lost most of their statistical edge. Still, they are traded at high discounts, but we are cautious when we select our positions due to the lack of statistical edge. I still see several interesting buying opportunities in the sector, which I am going to discuss with you in this article. 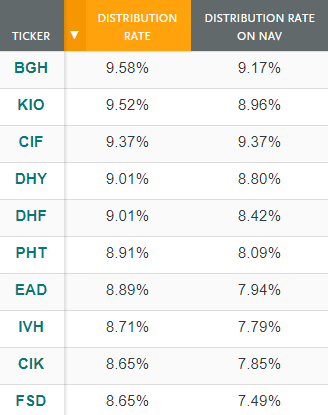 PGIM Global High Yield Fund (GHY) is the fund with the highest discount in the sector. I think it is an interesting buying opportunity based on the discount and its current yield. 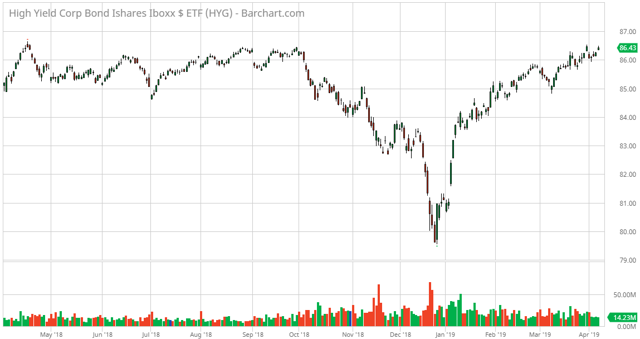 On a weekly basis, the price of the iShares iBoxx $ High Yield Corporate Bond ETF (HYG) reported a slight decrease of $0.04 and finished at $86.43 per share. Of course, it is important to notice that on 1st of April, the benchmark distributed its monthly dividend of $0.3787 which was reflected in the price. The strong performance of the high-yield bonds continues, encouraged by gains in equities. The increased price of the main index and the narrowing spread between the high-yield bonds and the Treasury bonds are indications for returned positivism and seeking higher yields from the market participants. 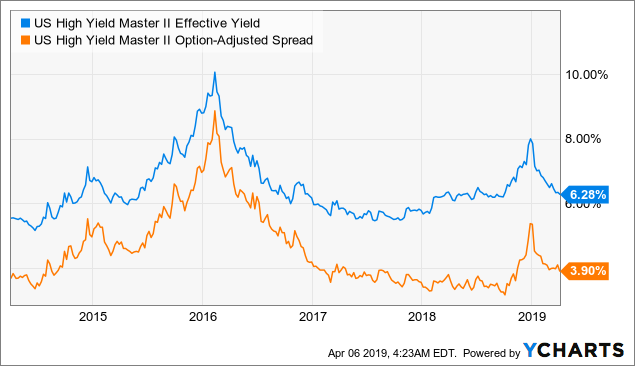 The spread is simply the compensation a bond investor receives over the risk-free rate, which in this case is the U.S. Treasury rate. On a weekly basis, we notice a decrease of 0.18 bps. As we can see, the current levels are significantly lower compared to the ones of the financial crisis. 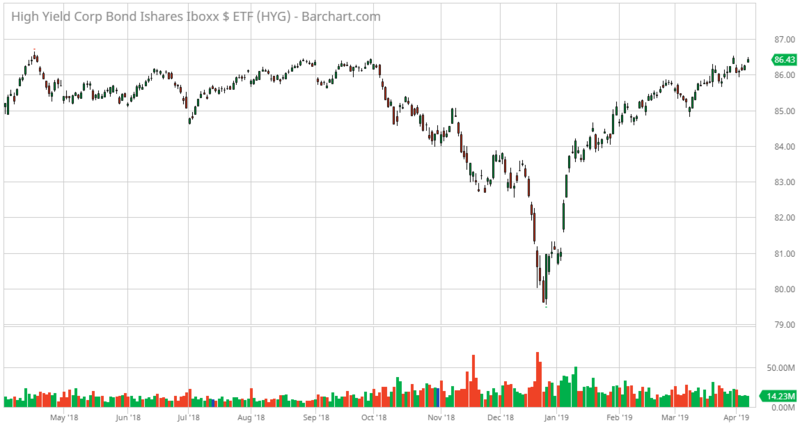 On the other hand, we have a statistical comparison between HYG and the SPDR S&P 500 Trust ETF (SPY). There's definitely a stronger relationship between them. 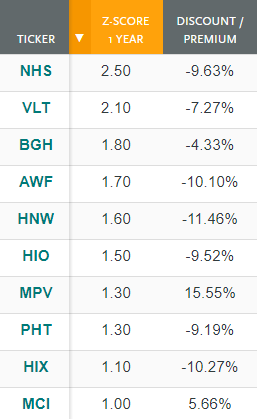 Ivy High Income Opportunities Fund (IVH) $0.1000 per common share. Invesco High Income Trust II (VLT) $0.0964 per share. 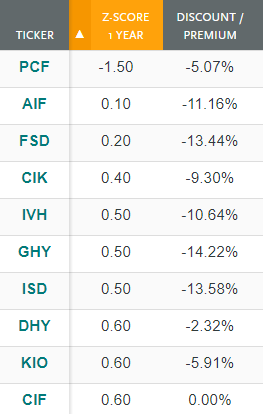 MFS Intermediate High Income Fund (CIF) $0.0201 per share. Pioneer Diversified High Income Trust (HNW) $0.0950 per share. Pioneer High Income Trust (PHT) $0.0675 per share. Apollo Tactical Income Fund, Inc. (AIF) $0.1040 per share. As usual, I will start our weekly review by presenting the Z-scores in the sector as an indication for statistically overpriced or undervalued funds. Simply put, a Z-score is the number of standard deviations from the mean a data point is. But more technically it is a measure of how many standard deviations below or above the population mean a raw score is. 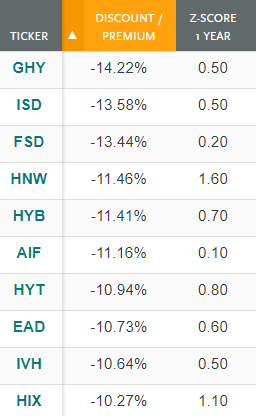 Currently, we do have only one fund from the sector which is traded at negative Z-score of -1.50 points. 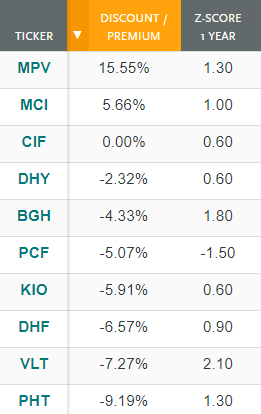 The price of High Income Securities Fund (PCF) fell by 0.55% which is the main factor for the widened discount. Regarding this fund, it is interesting to mention that it is one of two funds from the area which do not use leverage. However, I am not very interested in PCF at all due to its unattractive current yield. The offered return is 3.78% which is really non-competitive for this sector. Apollo Tactical Income Fund, Inc. (AIF) remains in the second position. 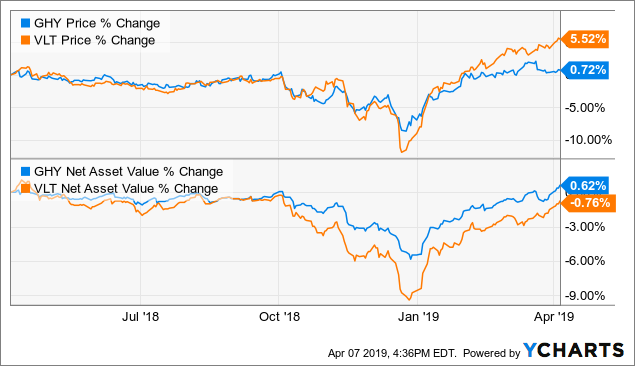 As we saw above, according to Yahoo News the next distribution for the month of April 2019 is $0.1040 per common share which is slightly lower compared to the previous dividend of $0.1070 per common share. 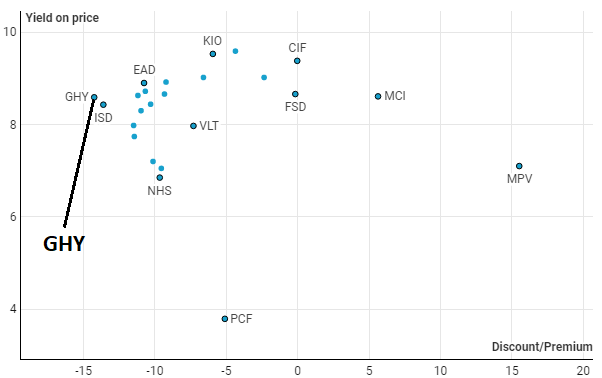 On the other hand, are the funds with the highest Z-scores in the sector. Theoretically, they should pretend to be potential "Short" candidates due to their trading above the mean discount/premium for last year. From a statistical perspective, I could say that only the funds which are traded above 2.00 points are the ones which caught my attention. However, they may be overpriced based on the statistical model but in a period when the sector is strong I do not want to take naked sell positions in them. 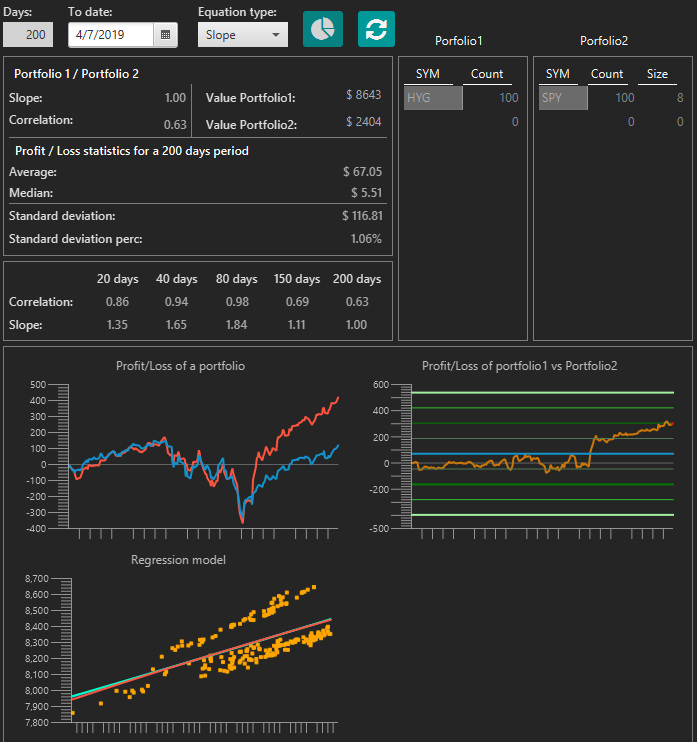 In other words, if I see the potential for short positions I will start with the closed-end funds which have the highest Z-score but till then I will only observe them actively. A strong week for the price of Neuberger Berman High Yield Strategies Fund (NHS). It rose by 2.21% while its net asset value reported a gain of 0.87%. As we see on the chart below, the fund has not been traded at such discount since the beginning of 2018. 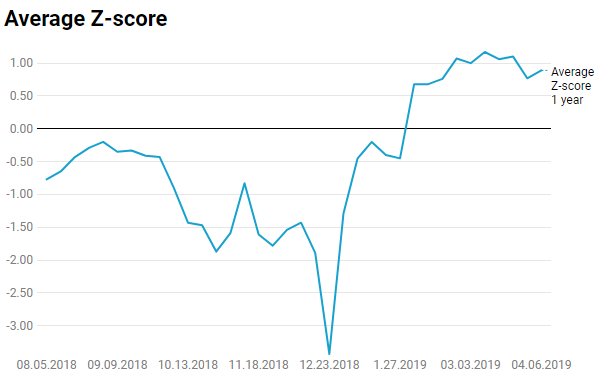 The average Z-score of the high-yield CEFs is 0.89 points. On a weekly basis, we find an increase of 0.12 bps of the average value. It is pretty interesting to notice the drastic change. At the end of December, we had -3.43 points average Z-score, and now, it is close to 1.00 point. On a weekly basis, most of the high-yield closed-end funds reported increases of their net asset values and the rest did not have a change in this metric. 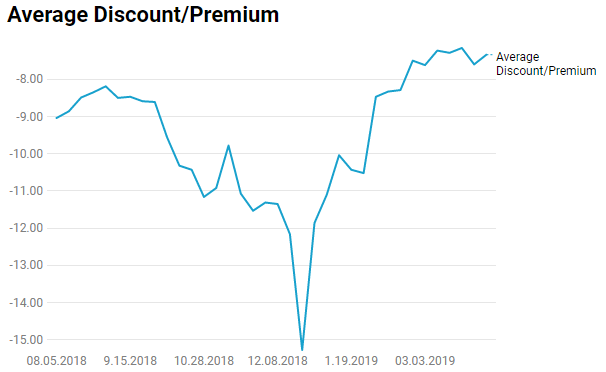 No doubt the spread between the net asset value and the price is an important part of each analysis and I am pretty sure the rational market participants are not eager to pay a premium. PGIM Global High Yield Fund (GHY) is traded at 14.22% discount. 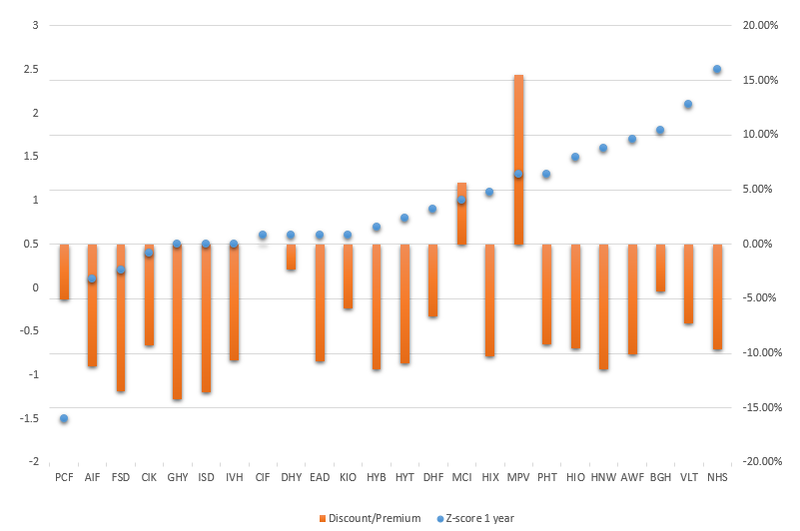 The below chart compared the discount of GHY to the discounts of its peers. The current one is one of the biggest spreads between them. For me, the fund should be reviewed as a potential "Long" candidate. A key moment here was the recent dividend increase. I will spend more time on it later in our analysis. The average discount/premium of the high-yield CEFs is -7.33%. Last week, the average spread between prices and net asset values was -7.60%. Several words about Barings Participation Investors (MPV). It is the only fund that traded at a significant premium from the sector. I would not review it as a potential "Sell" candidate because it has a very low average daily volume of 13,000 shares per day and the updates of the NAV are very rare and we cannot be sure what is a real premium of the fund. As I actively trade, this setup is not something which I will trade. Hm, actually I will but only if I see extremely high value from the Z-score. Something above 4.00 points will be enough to change my mind. The good past results of Barings Participation Investors (MPV) and Barings Corporate Investors (MCI) are the main reason why we find them traded at a premium on a constant basis. 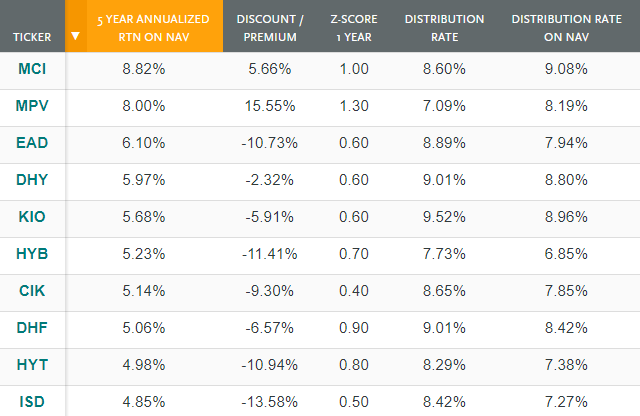 These are the closed-end funds which outperformed their peers over the past five years by return on net asset value. Unfortunately, none of them provide us with an attractive statistical edge to review it. Then the Z-score value is between -1.00 point and +1.00 point that means 68% of the time the fund was traded at this discount or premium. The average return for the past five years is 4.92% for the sector. As you can see, the current yields of most of the funds are much higher than the historical ones. The average yield on price for the sector is 8.20%, and the average yield on net asset value is 7.60%. We have already seen that most of the funds are trading at a discount, so this difference should not surprise us. We have two funds which are not leveraged and three which use leverage below 10%. The average leverage for the sector is 26.77%. Below, you can see the relationship between the effective leverage of the funds and their yield on net asset value. I have already mentioned the fund which is going to be reviewed today. 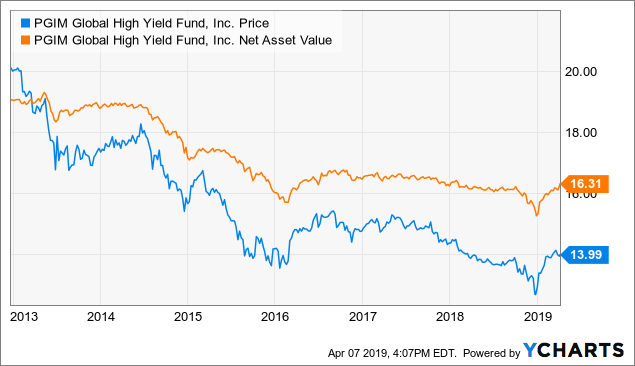 In the face of PGIM Global High Yield Fund (GHY) I see an interesting opportunity for our portfolios. 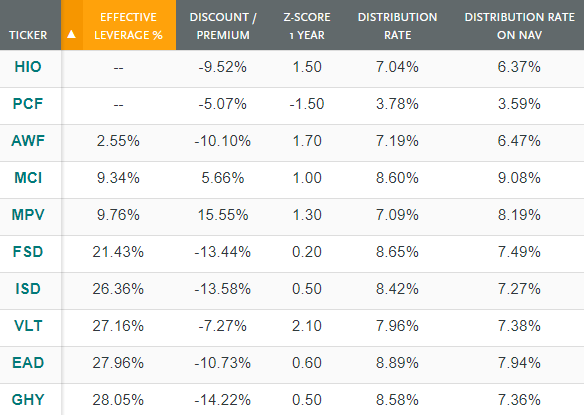 The main factors for my decisions are the high discount, relatively low Z-score and one of the lowest effective leverages in the sector. The Fund seeks to provide a high level of current income by investing primarily in below investment-grade fixed income instruments of issuers located around the world, including emerging markets. Currently, the fund is traded at 14.22% discount. The spread between its price and net asset value is relatively high compared to its peers. As we saw in our review, the average discount of the sector is 7.33%. We do have a yield on the price of 8.58% and yield on the net asset value of 7.36%. The current distribution is $0.1000, and it is paid on a monthly basis. I consider as a positive fact the recent dividend increase which was initiated in March. The latest information about the earning coverage ratio was announced in the end of January when the dividend was $0.0825 per share and an earning of $0.0840 enough to cover it. My assumption here is that the next earnings will be higher and it is based on the latest increase in the dividend. For me, the most rational move is when you increase the dividend to expect a higher earning as well and I hope it will be valid. 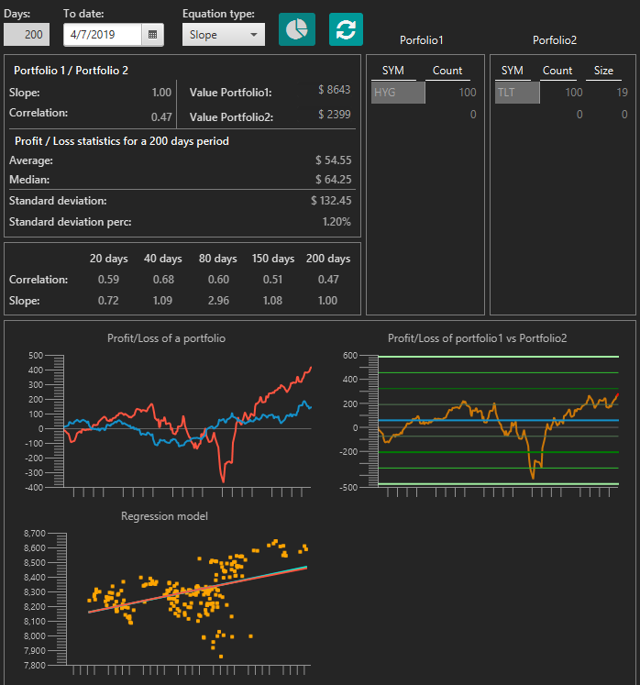 It is time to delve into more details about the portfolio quality. The main distribution is between "BB" and "B" ratings. 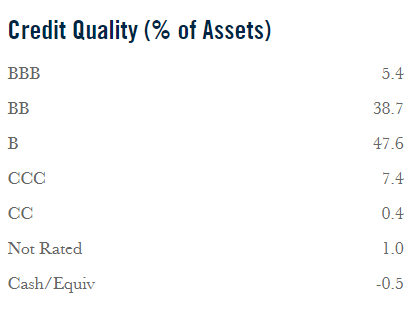 The assets with investment grade quality are 5.4% and the assets which are not rated are only 1.00%. The portfolio is constructed by issuers located globally, but 60.5% of the assets are located in the United States. 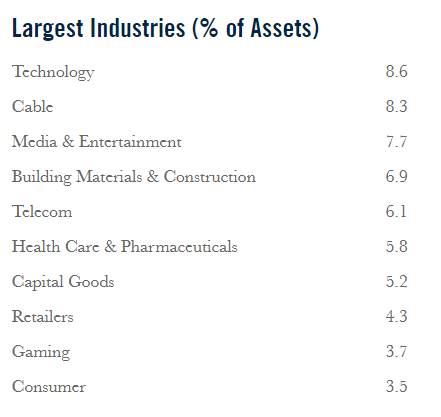 A brief overview of the investments shows that "Technology" and "Cable" sectors have the biggest weights. Leverage adjusted duration of GHY is 2.6 years. High-yield bonds and closed-end funds which invest in them have a lower duration in comparison to the municipal bond CEFs for example. The effective leverage used by the closed-end fund is 27.96%. Compared to its peers we are talking about an average value for the sector. The average leverage used in the high-yield CEFs sector is 26.77%. As you know, one of our purposes is to be prepared always for unexpected events and outcomes. Therefore, we insist on having a hedging reaction to our positions. As a hedge, we can use the Invesco High Income Trust II . They have a pretty strong correlation between their net asset values. Additionally, VLT has one of the highest Z-scores in the sector at that moment. The high-yield sector does not provide us with significant arbitrage opportunities at present. Most of the CEFs are trading at discounts, and it is difficult to find reasonable "Short" candidates. On the other hand, there are still interesting funds which provide us with an attractive valuation to review them as potential "Buy" candidates. Based on the data that I have reviewed, GHY can be a potential addition to your portfolio. Note: This article was originally published on April 07, 2019, and, as such, some figures and charts might not be entirely up to date. At Trade With Beta, we also pay close attention to closed-end funds and are always keeping an eye on them for directional and arbitrage opportunities created by market price deviations. As you can guess, timing is crucial in these kinds of trades; therefore, you are welcome to join us for early access and the discussions accompanying these kinds of trades. Disclosure: I/we have no positions in any stocks mentioned, but may initiate a long position in GHY over the next 72 hours. I wrote this article myself, and it expresses my own opinions. I am not receiving compensation for it (other than from Seeking Alpha). I have no business relationship with any company whose stock is mentioned in this article.